Form handling and submission is an important part of any web application. Play comes with features that make handling simple forms easy and complex forms possible. Play’s form handling approach is based around the concept of binding data. When data comes in from a POST request, Play will look for formatted values and bind them to a Form object. From there, Play can use the bound form to value a case class with data, call custom validations, and so on. Typically forms are used directly from a Controller instance. However, Form definitions do not have to match up exactly with case classes or models: they are purely for handling input and it is reasonable to use a distinct Form for a distinct POST. and finally, processing the result (or errors) of the form in a view template. The Forms object defines the mapping method. This method takes the names and constraints of the form, and also takes two functions: an apply function and an unapply function. Because UserData is a case class, we can plug its apply and unapply methods directly into the mapping method. Note: Maximum number of fields for a single tuple or mapping is 22 due to the way form handling is implemented. If you have more than 22 fields in your form, you should break down your forms using lists or nested values. But most of the time you’ll use forms from within an Action, with data provided from the request. 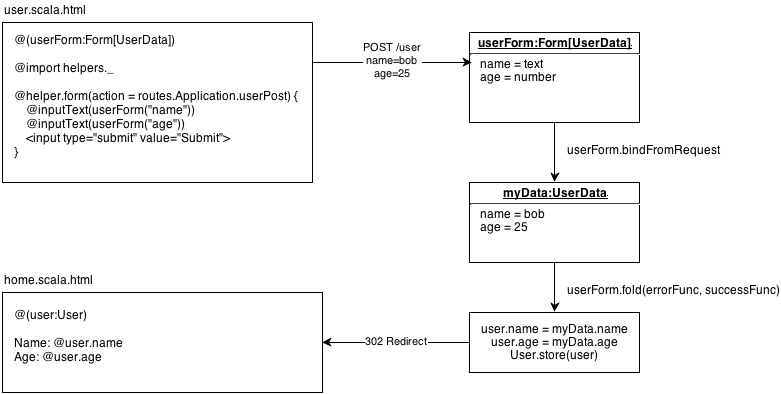 Form contains bindFromRequest, which will take a request as an implicit parameter. If you define an implicit request, then bindFromRequest will find it. Note: There is a catch to using get here. If the form cannot bind to the data, then get will throw an exception. We’ll show a safer way of dealing with input in the next few sections. Form specific case classes are convenient. Case classes are designed to be simple containers of data, and provide out of the box features that are a natural match with Form functionality. Form specific case classes are targeted specifically to the Form. Reusing model case classes can be convenient, but often models will contain additional domain logic and even persistence details that can lead to tight coupling. In addition, if there is not a direct 1:1 mapping between the form and the model, then sensitive fields must be explicitly ignored to prevent a parameter tampering attack. The text constraint considers empty strings to be valid. This means that name could be empty here without an error, which is not what we want. A way to ensure that name has the appropriate value is to use the nonEmptyText constraint. text: maps to scala.String, optionally takes minLength and maxLength. nonEmptyText: maps to scala.String, optionally takes minLength and maxLength. number: maps to scala.Int, optionally takes min, max, and strict. longNumber: maps to scala.Long, optionally takes min, max, and strict. bigDecimal: takes precision and scale. date, sqlDate, jodaDate: maps to java.util.Date, java.sql.Date and org.joda.time.DateTime, optionally takes pattern and timeZone. jodaLocalDate: maps to org.joda.time.LocalDate, optionally takes pattern. email: maps to scala.String, using an email regular expression. You can define your own ad-hoc constraints on the case classes using the validation package. You also have the option of constructing your own custom validations. Please see the custom validations section for more details. Now that we have constraints, we can validate the form inside an action, and process the form with errors. We do this using the fold method, which takes two functions: the first is called if the binding fails, and the second is called if the binding succeeds. In the failure case, we render the page with BadRequest, and pass in the form with errors as a parameter to the page. If we use the view helpers (discussed below), then any errors that are bound to a field will be rendered in the page next to the field. In the success case, we’re sending a Redirect with a route to routes.Application.home here instead of rendering a view template. This pattern is called Redirect after POST, and is an excellent way to prevent duplicate form submissions. Note: “Redirect after POST” is required when using flashing or other methods with flash scope, as new cookies will only be available after the redirected HTTP request. Alternatively, you can use the parse.form body parser that binds the content of the request to your form. In the failure case, the default behaviour is to return an empty BadRequest response. You can override this behaviour with your own logic. For instance, the following code is completely equivalent to the preceding one using bindFromRequest and fold. You can find several input helpers in the views.html.helper package. You feed them with a form field, and they display the corresponding HTML input, setting the value, constraints and displaying errors when a form binding fails. Note: You can use @import helper._ in the template to avoid prefixing helpers with @helper. form: renders a form element. inputText: renders a text input element. inputPassword: renders a password input element. inputDate: renders a date input element. inputFile: renders a file input element. inputRadioGroup: renders a radio input element. select: renders a select element. textarea: renders a textarea element. checkbox: renders a checkbox element. input: renders a generic input element (which requires explicit arguments). Note: All extra parameters will be added to the generated Html, unless they start with the _ character. Arguments starting with _ are reserved for field constructor arguments. For complex form elements, you can also create your own custom view helpers (using scala classes in the views package) and custom field constructors. key: should be the same as the field. message: a message or a message key. args: a list of arguments to the message. errors: returns all errors as Seq[FormError]. globalErrors: returns errors without a key as Seq[FormError]. error("name"): returns the first error bound to key as Option[FormError]. errors("name"): returns all errors bound to key as Seq[FormError]. Fill is especially helpful for helpers that need lists or maps of values, such as the select and inputRadioGroup helpers. Use options to value these helpers with lists, maps and pairs. Note: When you are using nested data this way, the form values sent by the browser must be named like address.street, address.city, etc. When you are using repeated data like this, there are two alternatives for sending the form values in the HTTP request. First, you can suffix the parameter with an empty bracket pair, as in “emails”. This parameter can then be repeated in the standard way, as in http://foo.com/request?emails[email protected]&emails[email protected]. Alternatively, the client can explicitly name the parameters uniquely with array subscripts, as in emails, emails, emails, and so on. This approach also allows you to maintain the order of a sequence of inputs. The min parameter allows you to display a minimum number of fields even if the corresponding form data are empty. This maps to an Option[A] in output, which is None if no form value is found. Here’s an example of what a model and controller would look like for managing an entity. Note that Contact contains a Seq with ContactInformation elements and a List of String. In this case, we can combine the nested mapping with repeated mappings (defined with Forms.seq and Forms.list, respectively).